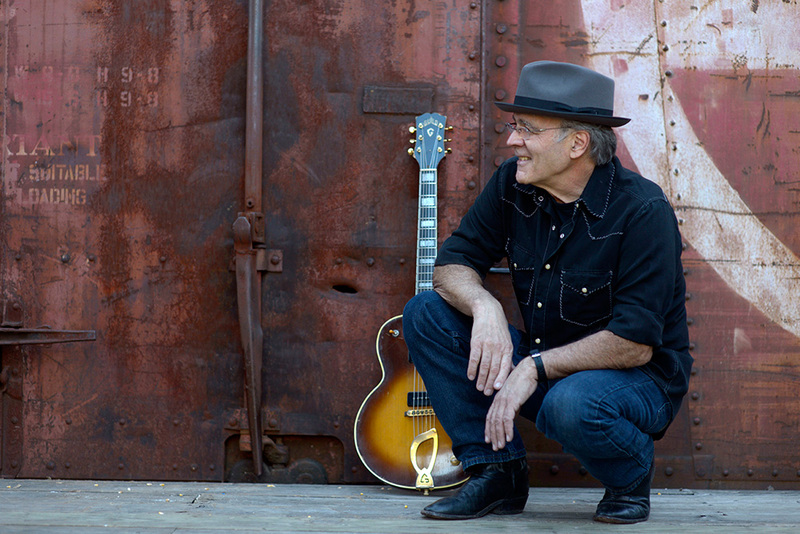 Juno Award winner, singer, songwriter, guitarist, and harmonica player Ray Bonneville finds his way to Baur’s Listening Lounge for an intimate night of rootsy-folk and swampy blues. He is known for his “loose, darkly funky vibe” (All Music Guide) with his weathered voice and percussive guitar. Opening for Ray is folk and Americana musician, Thomas Hine. Colorado Blues Society, KUVO and Music Appreciation Society invite you, your friends, and family for an authentic night of blues. Canadian born, Austin based, Ray Bonneville’s Red House release Goin’ By Feel was named one of the best CD’s of 2008 by DownBeat Magazine and featured the Americana hit “I Am the Big Easy,” which was #1 most played song on folk radio that year and won the Folk Alliance Award for Song of the Year. The tune was a powerful tribute to the resilience of New Orleans, where Ray lived for half a decade and picked up his funky fingerpicking guitar style. Noted for having one of “the sexiest guitar styles around” (Acoustic Guitar), Ray is a unique player and has performed with such blues luminaries as B.B. King, Muddy Waters, and Robert Cray. He has quickly become a fixture in the Americana scene since moving to Texas, becoming one of the go-to session players for artists like Ray Wylie Hubbard, Mary Gauthier and Eliza Gilkyson. Following the success of his digital single “Mississippi” (about the flooding of the Mississippi River), Ray releases his new full-length album Bad Man’s Blood. Like this summer’s single, the new songs have a down and dirty quality, capturing the hardships of every day life. Born in French Canada and raised in the United States, he writes from his experience as an immigrant, Vietnam War vet, taxi driver and bush pilot, drawing inspiration from the many places he has called home—Montreal, New Orleans, Colorado, Arkansas, Alaska, Boston, Seattle and Paris, France. Honing his songwriting craft for the last 35 years, Ray’s gritty storytelling and deep-grooving blues style has won him much critical attention. In 1999, Ray won the prestigious Juno Award (Canadian “Grammys”) for his third album Gust of Wind. His fourth release, Rough Luck, was also nominated for the coveted award. With his 2004 Red House debut Roll It Down, Ray made a name for himself in the US, garnering rave reviews from DownBeat and No Depression. Since then, his star has been on the rise, with his award-winning release Goin’ By Feel, his folk-charting cover of Bob Dylan’s song “It Takes a Lot to Laugh, It Takes a Train to Cry” (featured on A Nod to Bob 2: An Artists Tribute to Bob Dylan on His 70th Birthday), Bad Man’s Blood, and now Easy Gone, released in 2015, his 10th album. 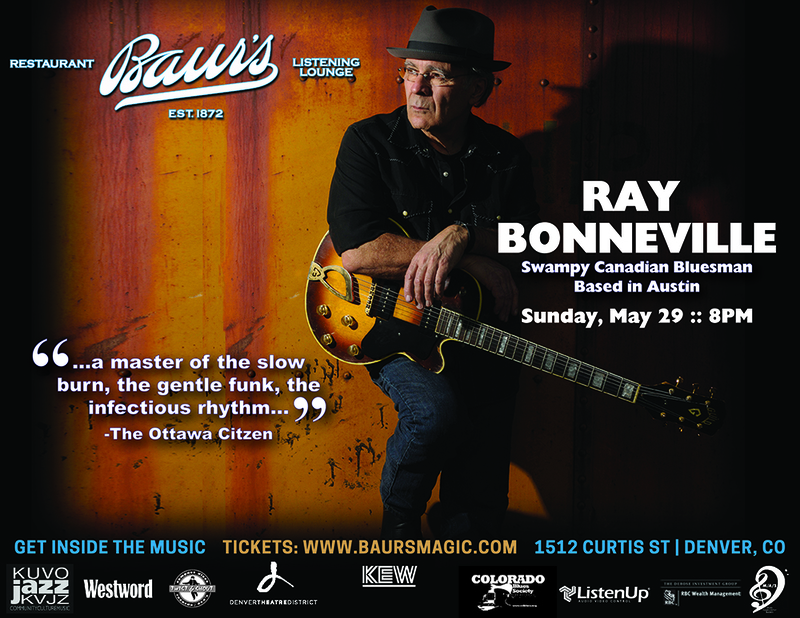 Music Appreciation Society and Colorado Blues Society invite you to the intimate setting of The Listening Lounge at Baur’s with guitarist, harmonica player and hard-hitting songwriter, Ray Bonneville. His weathered voice and virtuoso playing convey his vast array of life experiences touring the world playing music. 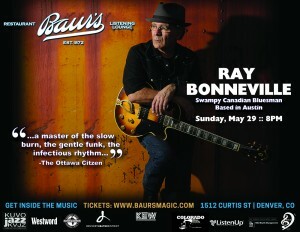 Head to Baur’s on May 29 and get lost in the world of Ray’s swampy, Rootsty-folk and blues.